After we saddled up with the poor chum at the fuel dock who preferred to refer to me as a dude, we headed over to our slip at The Wharf to tie the boat up, secure her for the night and let the ole’ Rest rest. 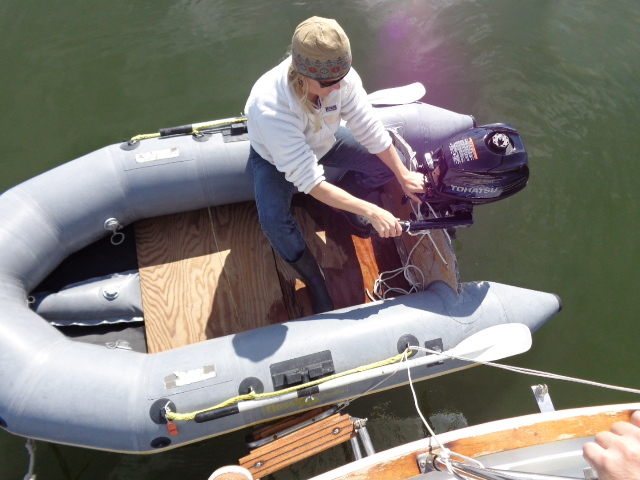 Then we started snatching and grabbing everything on the boat that could use a good washin’ (which was just about everything). I seriously debated taking down the curtains. Like I said – eight days at sea. We had sack fulls – clothes, trash, bottles, you name it. 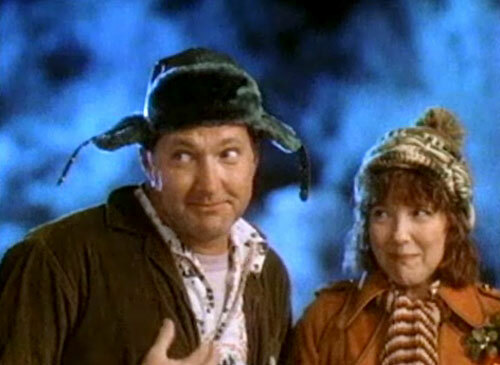 Phillip and his eskimo sidekick looked like a ratty bag couple hauling all of our junk off of the boat. We felt kind of sorry for Phillip’s folks when we kindly knocked on their condo door asking ever so politely to use their facilities. I mean, were we really going to barge in, start washing every stitch of clothes we brought with us and eating everything in sight? Of course we were! “Pull up a chair Irene.” (Although I have to admit, I have no idea if her name was really Irene. 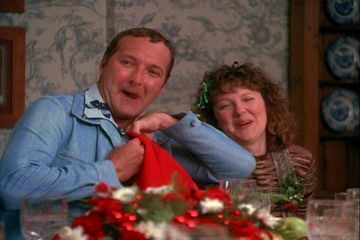 It seems fitting, but Cousin Eddie shone so brightly in that bit, I don’t think she was ever even anointed with a name – at least not one anyone would remember). We started running the washer immediately, tore into the fantastic spread that was laid out on the bar and started jockeying for position in the shower line-up. While we had heated some water on the boat and enjoyed a nice warm rinse-down several times during our trip, those “showers” had been brief (water conservation is always a concern) and a little cramped in the stand-up shower stall on the boat. Now, with the full use of a regular-sized bathroom at our disposal and an endless supply of hot water on our hands (or so it seemed). Phillip and I each took our turn and gave ourselves the royal spa treatment from head to toe before curling up in the main room to regale the groupies with our tall tales at sea. 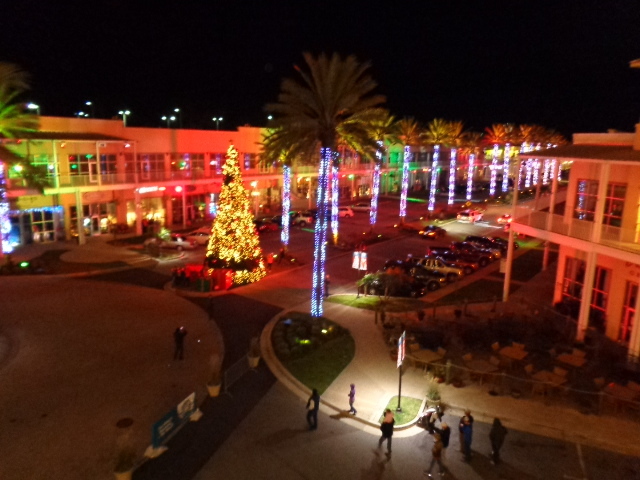 We decided to get out that night and catch the new Catching Fire movie at the theater at The Wharf. For the holidays, they put on a light show every night where the lights, which cover every inch of the palm-tree lined main drag, pump and pulse to holiday music, and that was pretty awesome. Or, psychedelic at least. But, the best part was the complimentary movie! Or so we thought. As we started to walk into the theater, the ticket booths outside were all empty. No lights were on, no tellers were standing behind them. There was no one there to whom we could tell which flick we wanted to see and pay them for the appropriate ticket. A little stumped, we walked into the theater and, again, there was no usher standing at the little podium by the door, asking for our ticket to inspect and tear. We started to look around and wander, but there was even a second podium before the entrance to the west bank of theaters with, still, no usher, no teller, no one in sight. Phillip started to saunter toward the red sign reading Catching Fire 7:15 and we all kind of made a collective decision to saunter along behind him and not say a word. And, so we did. And, we walked right into that theater and sat our happy selves down for a complimentary movie, deciding they must have just decided to allow free showings for the holidays. Lucky us! Until Phillip’s sister, Kristen, came rumbling in. We had apparently lost her during our saunter to the smell of butter, salt and the melted yellow plastic they drizzle on the tortilla rounds they call nachos at the concession stand. She was loaded down with two nacho packs, the BIG BAG (patent pending) of popcorn and two large sodas as she shuffled and crinkled her way toward our seats. She chucked a few popped kernels back and mumbled, “Man, these movies are expensive,” to which we all responded with raised eyebrows. Expensive? Kristen looked back at us with an equal stare of confusion. “At the concession stand,” she said. “They charge you at the concession stand.” Whoops. Figuring we’d settle up later, we curled up to enjoy us a mighty fine pitter show. 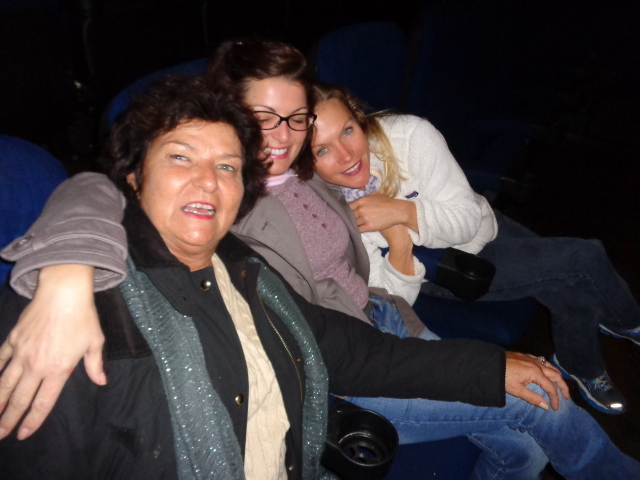 And, after the show, we went immediately to the concession stand to pay for our movie. Naturally. What kind of people do you think we are?? When we got back to the condo, Phillip’s mom started rushing to the back porch to get at the turkey. Earlier in the day, Phillip and his mom had dunked the turkey in a cloudy bath of salt and spices, sacked it up in a Hefty trash bag in an over-sized Igloo and set out on the back porch. Phillip said we were “brining it,” which I had never heard of before. Growing up, our Thanksgivings involved the thawing of a pre-cooked turkey and a Wal-Mart run for a jar of jellied cranberry sauce, the kind that sloshes out onto the plate with ring imprints on it, an exact replica of the can it came from. Phillip’s “brining” looked, to me, like he was baptizing the turkey in a bath of murky salt water and Joe’s seasoning, but, with my canned-garnishes background, I wasn’t one to judge. I was along for the ride either way. But, apparently, they hard forgot to take the gizzard and some other little bag of giblets out of the turkey before baptizing it, so Phillip’s mom engaged in a rousing bout of what I like to call turkey wrastlin’ which I, naturally, filmed for your viewing pleasure. Enjoy! Video here. And, you gotta love Paul’s comment at the end: “Now, Mary, go wash your hands.” Priceless! With the turkey officially violated, we set her back out on the porch to continue brining for the night and Phillip and I curled up on the sofa bed in the living room (agreeing through whispers that our v-berth was far more comfortable), but we knew we’d soon find ourselves back on the boat. So, the sofa bed it was. We woke Thanksgiving morning to a beautiful sunny day. 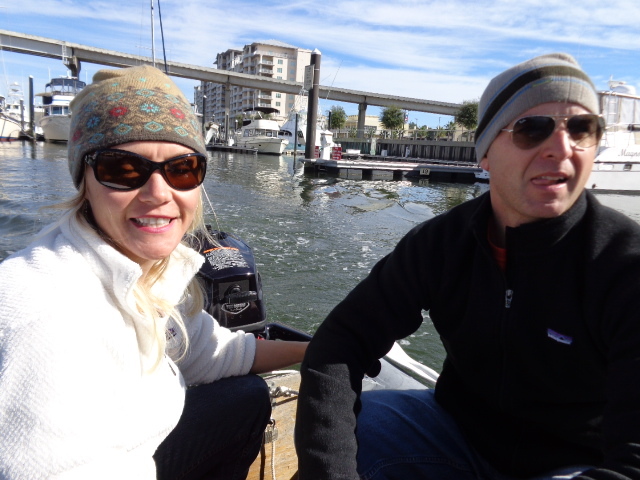 We decided to get out and putter around in the dinghy a bit and check out some of the boats in the marina at The Wharf. But, we never expected what we encountered on the way back. As Phillip and I were walking back from the boat, the smell captured both of us immediately. We turned to each other in silence, eyebrows lifted and a mischievous grin growing on both of our faces. It smelled like nuts and oil, cinnamon and butter, like pie but more savory. Like a syrupy piece of pecan pie drizzled with rich turkey gravy, a symphonic concoction of scents, like an exorbitant feast of dinner, dessert, nuts, bread, oil and gravy, all laid out at once, a delectable cloud rolling into us. I describe it like it was laid out as an endless bounty, a full Thanksgiving spread with all of the fixings, because that’s what it smelled like, but when we turned the corner, we found only two pot-bellied men, standing near some stained dumpsters and a rusty door that read “Employees Only.” The men were leaning over a white fold-up table, with throw-away foil trays littered about and a couple greasy pair of tongs and were bundled up and staring into an over-sized steel vat of oil, bubbling and sputtering, and emanating that savory, succulent smell that had overwhelmed us. They were frying turkeys. Although a relatively new culinary phenomenon – I think the whole turkey frying revelation started about 4-5 years ago, it seems quite mainstream now. You drop the whole dad-gum thing into a vat of peanut oil, completely submerged, and let that oily fried goodness soak through every pore of the turkey until it is utterly saturated, unable to hold a single more drop of fatty, peanut-drenched nectar. A fried turkey is the best turkey. Period. Phillip and I salivated, swallowed, wiped our mouths instinctively and tried to make mindless small talk as we walked by. “So. You guys frying turkeys?” I mean, really? I was even embarrassed by the question. The guys should have responded, “Nope. We’re just standing around a vat of oil on Thanksgiving to fry us up a batch of Ore Ida crinkle fries.” It was one of those “small-talk” questions that you regret later, but you can’t think of anything else to say in the moment. Like when you’re on the elevator with someone you know lives in your building and while you have absolutely no inclination to talk to the person at all, common courtesy tells you have to say something, so you open with, “ Boy, it sure is getting cold out there.” The weather. That’s equivalent to commenting on the obvious. Of course they were frying turkeys. The larger man gave us a light nod and walked back inside. I can’t blame him. The smell had obviously brought us in, and he wanted no part of the lame elevator conversation that was about to ensue. That left Phillip and I with the thick, stocky, corn-fed boy that remained, donning a long-sleeve Guy Harvey shirt stretched taut around his mid-section and a baseball cap shoved down over a shaggy, dishwater brown mop that fell around his ears. But the guy was friendly, thankfully, and seemingly looking for a distraction. “Yep. We’ve fried up several this morning.” It was a kind answer, a patient one. Phillip and I had sort of stopped, if only to bask for a moment in the nutty aroma, but once the mystery scent source was confirmed, we didn’t have much else to go on, except the weather. So, we gave him one quick “Well it smells delicious. Happy Thanksgiving,” and went about our way. Guy Harvey held up some tongs and said, “Thanks. Y’all too.” We walked just a few steps in silence, thinking the exact same thing. Damn, I wish he’d fry up ours. 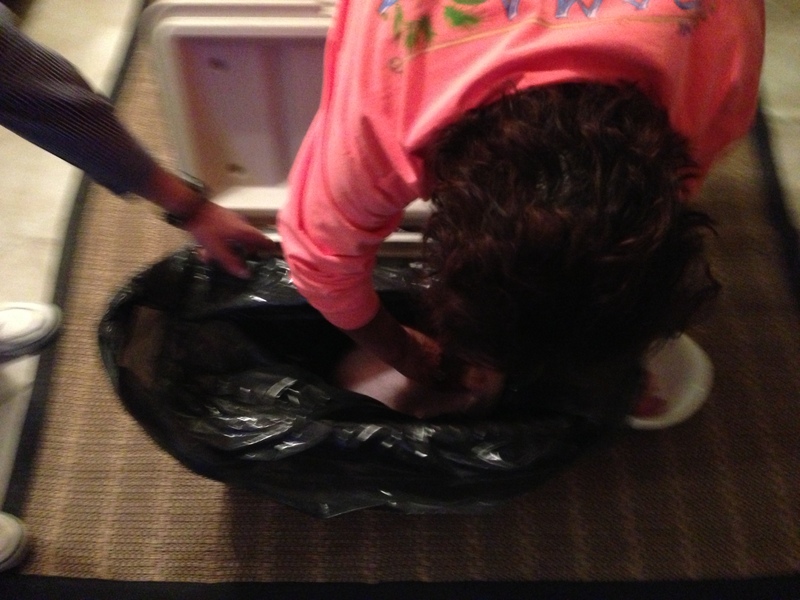 “Ours” was currently swimming in the Hefty trash bag on the back porch, looking anything but appetizing. My eyes widened as a sly smile spread over Phillip’s face. This was happening. I gave Phillip a quick wink and headed back to hustle up Kristen and all her accouterments. I found her squeezing into a pair of dark, midnight denim pants and slipping a soft, purple cashmere sweater over her svelte figure. She whirled around to face me with a devilish grin. “What do you think? Wait … what are we doing?” I loved it. The girl had no idea what we were about to be hustling, but she was ready regardless. And, she looked flawless. Thick, chocolate brown hair cascading around blue eyes and porcelain skin. “What am I asking for?” I couldn’t help but laugh. It was clear Phillip had sent her on many a-similar errand and she easily jumped to the task. But, she looked impeccable. I started to think we stood a chance. If she could entrance the two corn-fed boys near the oil vat long enough for me to blurt the request in or, if need be, throw the damn turkey in myself, we were going to be in business. She looked at me with a frown, though. I was still semi-eskimo, bundled, my hair having been smashed under a toboggan all day and donning jeans, a work shirt and still in my rubber rain boots. Kristen had her work cut out. She started in on me, throwing a sweater on, ratting and poofing my hair and smudging several different pink, powdery substances on my face. I had to chuckle as I watched the rest of the clan stand around us, salivating and admiring Kristen’s handiwork. 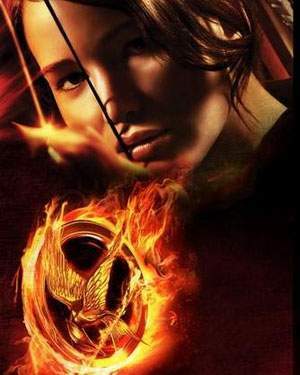 The masses were hungry and she was making me over like Katniss herself to win over the boys at the Vat Capitol. We were catching fryer. This entry was posted in Good Grub, Landlubber Outings, Thanksgiving Voyage and tagged 3.5 horsepower, catching fire, cousin eddie, dinghy, katniss everdeen, national lampoon's vacation, outboard, the wharf, tohatsu, turkey brining, turkey frying. Bookmark the permalink. Exercising your womanly wiles on T’giving day on a couple of hapless bubbas? Have you no shame, woman! No, I get it, that fried turkey is worth a little innuendo. But I’m sure bubba would have fried it for you even if you were in your Gorton’s outfit with 8 days of boat scrunge on you. The worst you would have had to do is offer him a sixy of Bud (yeah, you just like to play the game from time to time eh? You can’t fool me, it’s in the DNA) He seemed nice enough from your first elevator encounter when you inanely told him what he was doing, and he didn’t reply with a line like: No ma’am, this here turkey was in a feather accident (not as prepared as ole Fog horn or Johnny) and we are just warming him up a bit”. “Here’s your sign”. (Bill Engvall). I’ll have you know I did not then nor have I ever harbored “boat scrunge” following a passage. Okay, that’s not true. We were carrying it in droves. We should have harvested it and saved to sell to pharmaceutical companies for third world vaccines. Could’ve gone toward the cruising kitty!